Also, as for Small...I am one of the "Sized appropriately" people. Reason: "appropriately", based on purpose. More specifically, for example, I think its okay (preferable even) for stories that represent "way down the road" work, or a "just barely thought"/"might do" idea to be "bigger", whereas a story whose purpose is to represent iteration deliverables should, as you note, be much smaller. Or even something akin to Jeff Patton's ideas of "User activities and tasks", where activities are bigger stories, and tasks are the smaller stories that we actually implement at an iteration level. BTW, I think INVEST comes originally from Bill Wake. 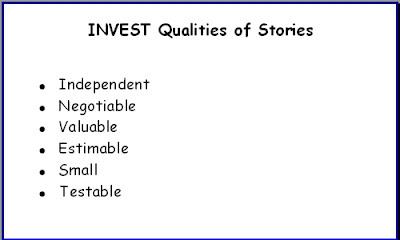 I remember struggling with some of the things in INVEST, and like the shorter VET. Small and negotiable always seemed obvious (or a bit vague) to us in the XP days. Independent is a good addition, though. VITE? VIET?